Mailjet 2019 review - why 4.6 stars? Mailjet is an email marketing service that offers businesses an easy way to send out newsletters and other mass emails to up to 900,000 customers. With an easy-to-use drag-and-drop system to design emails and data analytics available, any company, no matter the size, can use Mailjet to help reach and sell to more people. The template selection could be larger, and I wish that free plans included a few more features (even on a trial basis). That aside, it’s a complete service with many tools that allow you to not only design beautiful and professional-looking emails, but also reach a wider audience and help your business grow. You can also build a layout from scratch to fully customize your own emails. Otherwise, templates have a base layout, so if you have little time or patience for experimentation, you can just fill in the email with your information and send it out. Mailjet is aware that 53% of emails are opened on mobile devices. All of its templates are optimized so people can read them while they’re on the go. This is essential, because your customers will quickly move on to the next email if your layout doesn’t load or looks messy on their mobile device. In terms of design, most templates are quite basic, though they still look professional. Each template is uniquely designed specifically for its theme, which is very apparent. For example, e-commerce themes look different from travel themes, which look different from newsletters. This makes customization simple, because you’ve done some of it already just by picking a unique template. There could be a few more templates to choose from. I would have loved to see a restaurant theme, or maybe a newsletter with a dedicated “blogger” theme. But even if you don’t see a category you need, you can build it from one of the basic choices. One other drawback of the template selection is that there is no separate category for autoresponder emails; MailJet seems to offer only classic email options. For anyone who knows how to code, this provides freedom, as building your own template is a way to ensure that your email campaign truly does stand out. While HTML can be tedious to write, MJML helps you code faster so you can dedicate time to other tasks. A/B testing on Mailjet is easy. First, I set up the basics of my test like the name, language, and the contact list I wanted to send it to. Then, I set up the variable I wanted to test, such as the length of the subject line or image content. The simplest test has two versions and tests one variable. But Mailjet allows for up to 10 versions of one campaign. I used three. After creating three subject lines for a campaign, I was able to set the percentage of my contact list that I wanted to receive each email, set the time to start it, and choose whether the winning email was automatically or manually set. Another feature is segmentation, also available with a premium account. This allows you to group your customers into separate lists based on certain variables like what time your most engaged customers open emails. There’s even data to tell you when certain customers are inactive so that you can send them re-engagement campaigns. In the contacts section, all you do is click on Segmentation and then Create a Segment. Mailjet filters segments based on properties like “Name” or “Birthday,” or activity like when a person last opened an email. It can also filter your list by more than one property. So, I created a list of all contacts that live in New York and have opened an email from me in the last 14 days. After setting conditions, you can click on Calculate to know the exact number of subscribers that match your qualifications. Then you can save the list. Real-time collaboration on email design will save time for all premium users and everyone on your team. You can easily assign everyone roles (e.g., marketer, designer, or developer) and increase your team’s efficiency. You can add as many people as you want, and there’s no longer any need to wait for one person to finish his or her part of an email before working on yours. Email sections are blocked off as people work on them, and then you can instantly see the work your colleague has done. A nice feature available to everyone is the subscription widget. This allows people who opt-in to automatically be added to your email subscription list. There’s a double opt-in feature that both ensures your customer is interested in your offering and increases your GDPR compliance. The process of creating a subscription widget with Mailjet is fast and easy. You can either set it as a pop-up or embed it. You can collect more than an email address with the subscription widget. Use it as an opportunity to collect information like the name and address of your customer. Mailjet’s sign-up step is fast an easy. I answered a few questions about myself and my business, and in minutes was ready to design an email. The designing process is simple, too. 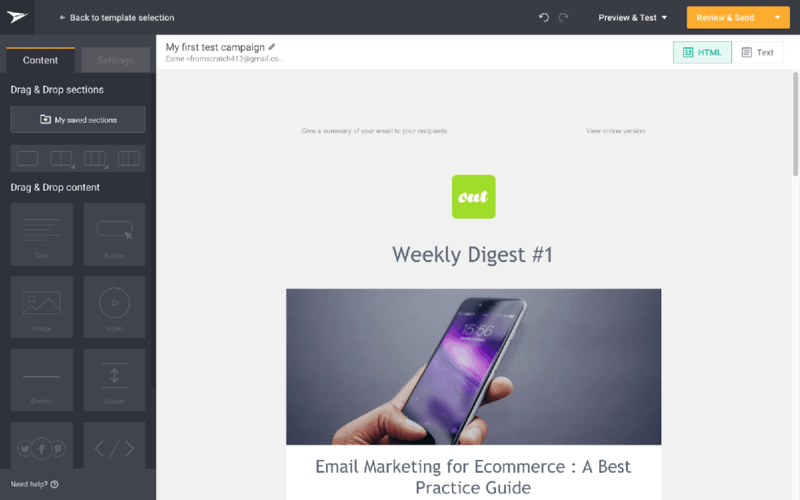 I was happy to see that Mailjet uses a drag-and-drop system for editing. I like that the editing screen is clean and clear, not cluttered. All of the elements available to add are labeled in a separate toolbar from the design screen, making it really easy to work. I chose a basic newsletter template and was able to personalize a campaign simply by clicking on the pre-placed element blocks and adding the specific content I wanted. Double-clicking an element produces specific menus. Clicking an image block, for example, leads to a screen where you can crop, resize, or change an image’s orientation. When my design was complete, I like that the “Review and Send” button allows me to check my work with the option to send instantly or save for later. Then I was asked to assign my ticket a priority level of either normal, urgent, or critical. I selected “normal,” and more than three days later, I have still not heard back. While I appreciate the fact that the ticket request form gives me an option to provide my phone number and mark a request as critical, I’d prefer to be able to immediately speak with someone, especially if I were faced with a potentially dire problem. That said, I wish Mailjet published a support number somewhere in their website, or at least offered live chat support, as many other email marketing service providers do. Mailjet offers monthly or annual plans. The price of your subscription depends on the volume of emails you plan to send per month. The free plan might be enticing, but if your email list has more than a couple hundred contacts, that plan will not be a viable option. The next plan up, Basic, includes all the features of the free plan but with no ads, no daily sending limit, and added support. It’s a good option if your business only needs to design and send out email campaigns. For access to some of the features that will contribute to your business’s growth, you’ll need the Premium plan, which unlocks access to A/B testing, segmentation, multi-user collaboration, and the other advanced features. I recommend this plan for established small businesses with a solid subscriber base looking to improve the quality of their marketing campaigns and gather insight into their subscribers. If you have the budget, it’s a great place to start no matter what you sell. The highest paid plan is the Enterprise plan, which is designed for larger companies and high-volume senders. It features a more “robust infrastructure,” access to deliverability and migration experts, advanced role management tools, and more. You need to Contact Mailjet and request a quote if this plan interests you, but I recommend that you start with the Premium plan first and move up only when you’re sure it’s not meeting your needs. Mailjet has a plan for any company, whether you work for yourself or have 10,000 employees. I enjoy the drag-and-drop system they use to design emails, and I love that I didn’t feel any overwhelm during the process. I think the collaboration feature that allows a team to work on email campaigns at the same time is a smart, unique feature that helps companies increase efficiency. I also like that there is a free plan (with a send limit) and no trial period. Startups with a limited budget can try the base features for as long as they need in order to determine whether Mailjet is right for them. I wish there were more variety with the templates, but I would certainly use the service myself.